Winter is fully fledged now, so much so we’re halfway through the footy season with my darling Sydney Swans sitting very comfortably in 4th place on the AFL ladder, just ahead of those pesky Fremantle Dockers. He helps save lives, now he wants to save hers. Dawn Granger has loved and lost and it’s a road she’s not prepared to travel again, that is until her past turns up and has her questioning her resolve. Andrew Holmes has sailed the globe numerous times, when he almost loses his life, he decides he needs to give something back so he returns home and trains as a paramedic. When he runs into his former sweetheart he is surprised to find an attraction he thought dead come to life. When he sees the sadness in Dawn he knows he will do anything to make her smile again. Dawn tries to resist Andrew but their past pulls at her in ways she thought long dead. Can she trust a man who’s run out on her once before? Can she risk putting her heart on the line again? Or will it all be taken from her again. Ooh, I adore a lovers reunited story and Rescuing Dawn sounds fabulously romantic. You can own a copy right now with just a few clickety-clicks on any of the following ebookstores: Kobo (most excellent sponsor of the 2013 Australian Romance Readers Convention), Google Play, Amazon (for Kindle) or iTunes. All loaded? Marvellous. Now let Nicole warm you up! I’m thrilled to be part of Cathryn’s Friday Feast. After looking over the previous Feast posts I wondered what the heck I was going to talk about. You see I’m the world’s most basic cook. If I could get away with it I’d have the same thing every night. Actually when I was living by myself I would. I’d have a piece of meat (steak or chicken or lamb) some salad, pasta shells, broccoli and peas. I figured the whole meat and vege deal was a good healthy meal. Not to mention it was easy and after a day at work I was all about easy. Now that I’m a published author I find I get caught either doing work work, or writing and it’s four o’clock and I haven’t thought about dinner! 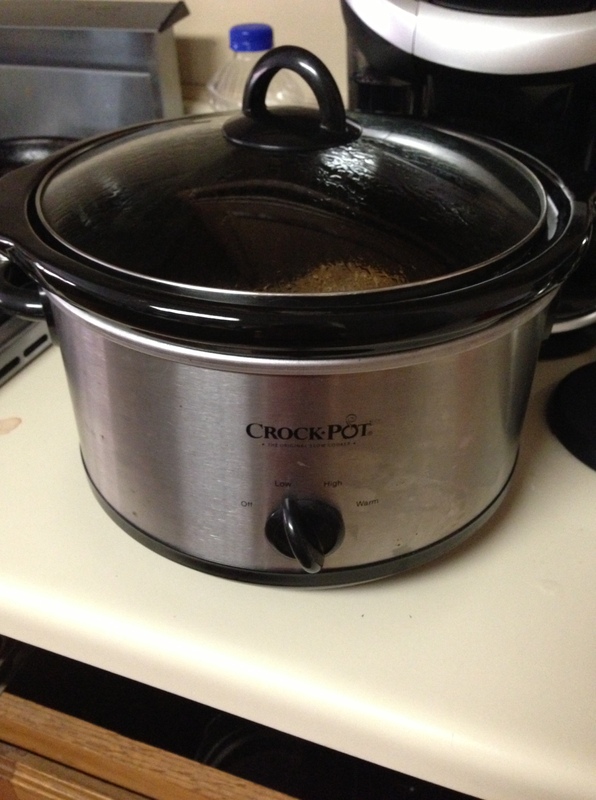 Some days I pull out my favourite little appliance – the Crock Pot! When my son walks in and sees it he’s all excited that I’m cooking his ‘favourite’ meal. 1-2kg of diced meat or 3 lamb shanks. Any other spices you may like! So there you have it. It really is a recipe where you can adjust the measurements to your liking. I’ll boil up some rice and serve it up with some crusty bread. Nice and warm on a cold winters night! Do you have a favourite winter meal? Ahh, the good old slow cooker, a saviour of many working folk, and this recipe looks a beauty, Nicole. Lamb shanks would have to be one of the most satisfying winter meats. All that sticky meat, cooked long and slow so it falls sweetly off the bone. Sigh. One could almost compose an ode to their joys. So, Feasters, hit us with your winter wonders. I know you have them. Delicious comfort foods just made for warming the soul when the weather is bad. Lamb shanks are a firm favourite in the Hein household but we’re also rather partial to a good beefy casserole like boeuf bourguignon or beef cooked in beer (oh, how I love that!). Oops, just made myself a bit drool-y, but I’m sure you have plenty more mouth-watering dishes to tempt us, so share away! If you’d like to learn more about Nicole and her books, please visit her website. You can also connect via Twitter and Facebook. This entry was posted in Friday Feast and tagged AFL, Australian romance authors, Australian Romance Readers Convention, Australian Writers, Cathryn Hein, contemporary romance, contemporary romance authors, Cooking, Crock Pot meals, ebooks, Food, Fremantle Dockers, Friday Feast, Google Play, iTunes, Kindle, Kobo, lamb shank recipes, lamb shanks, Nicole Flockton, promo, Recipes, Rescuing Dawn, Romance Writing, slow cooker meals, Sydney Swans, winter comfort food, winter recipes, winter warmers, Zane's Crock Pot Delight on June 21, 2013 by cathrynhein.